YouTube recently debuted a new iOS app designed for the younger generation. The company's YouTube Kids app promises to provide kid-friendly content in an interface that "even little ones can navigate." How does YouTube Kids deliver on its promises? Read on to find out what my little ones thought of YouTube Kids after using it for a few days. The first thing I noticed when I opened YouTube Kids is that the UI is very simple, colorful and arranged nicely. Catchy music plays in the background while large icons and video thumbnails make it easy for non-readers to find their favorite shows. The content is arranged in easy-to-explore "Channels" that provide access to a group of similar videos. The app launches to the "Shows" view, which provides access to the curated channels included in the app. As kids scroll through the channels, they can move from "Shows" to "Music", then to "Learning" and finally to the "Explore" section. The music portion provides kid-appropriate music videos such as "Sing Along to Disney," while the learning section offers videos from TEDEd, Khan Academy and more. The Explore section is a hodgepodge of content that kids may find interesting and include pet trick videos, play-doh videos, and more. If you use the app long enough, a "Recommended" section appears with video suggestions based on your child's viewing habits. The Channels are mixed with much of it geared towards the pre-school and kindergarten set. There are channels for elementary aged children, but they are interspersed in between the lullaby videos and Barney clips. This arrangement was a turn off for my seven-year-old who thought some of the shows were "babyish." To engage my older kids, I would have preferred an app that provided better separation of the content based on age or learning level. Profile support would be perfect, so I could create logins and change the content for my different children, but they may be too much to ask for the first version of an app. At the bare minimum, I would have appreciated the ability to modify the available channels, either by removing/hiding them or rearranging them, so my kid's favorite videos are up front. Though my elementary school-aged kids lost interest in the app as soon as they saw the Sesame Street and Thomas & Friends channel, my little ones loved it. The UI is very easy to use -- they were able to scroll through the channels and recognize their favorite shows thanks to the thumbnail-based arrangement of the videos. Watching a video only required a few taps, which is easy for both young and old children alike. The videos started playing immediately and quickly shifted automatically to a full-screen view. If a child taps on the video in fullscreen mode, the video continues to play, and the UI switches to a half-screen view that shows the other videos in the channel. This "pause block" is a well-thought-out feature that prevents confused frustration among the younger set who like to tap on the screen and then become upset that their video stopped. As long as the child doesn't inadvertently hit the pause button, the videos will keep flowing despite the continual tapping. When a child or parent picks a collection of videos to watch, such as the Thomas & Friends puzzles, the app will automatically play all the available videos without pause. This auto-play feature is especially useful for younger children who may not understand how to control playback. Most of the videos in a channel contain show episodes, but some videos contain event advertisements, puzzles, music and more . These "Events" and non-episode content are labeled, but non-reading children may not be able to discern the difference. One "feature" that may not sit well with parents is the inclusion of advertisements in the app. Similar to the desktop version of YouTube, the YouTube Kids app will occasionally display short advertisements before a video. The ads are appropriate for kids and last approximately 5 seconds. If kids are savvy, they can skip the ads by tapping the "Skip" button. Another feature in the app that should come under scrutiny is the search button. 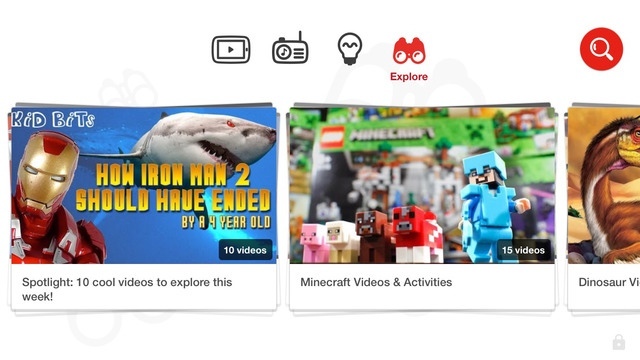 The YouTube Kids app allows children to search YouTube and watch videos beyond what is contained in the preset channels. The search option does filter most objectionable content and blocks searching for offensive terms, but it is not 100 percent foolproof. I searched for sled dog races and watched a video where one of the racers uttered an expletive. Parents who want strict control over the content of the app should head to the settings and disable the search button. The settings are accessible via a four-digit pin code number that is displayed on the screen in written words. For example, the pin code "7583" would appear as "Seven Five Eight Three." Parents must read the code and then type in the numbers. The code changes each time you access the settings, so you don't need to remember this number. As clever as it appears, this mechanism is useless with kids who can read as they can determine the code as easily as their parents. The settings contain the option to turn off the background music and sound effects of the app. There's also a toggle for the search function that allows you to turn off search and limit viewing to the videos on the home screen channels. The setting menu also provides access to a timer that will limit the amount of time the app will be available for your child to use. When the time expires, the app will lock down. Savvy children, like my five-year-old, can learn how to reactivate the app by closing it using the task switcher and re-opening it sans the timer. To prevent children from bypassing this control, parents can use Guided Access in iOS to lock children into the YouTube app and prevent them from closing it. Overall, the YouTube Kids app provides a safe environment for kids to browse the educational and entertaining content available on YouTube. Parents can hand over the app knowing that their children will view positive content and not stumble upon an inappropriate video. The inability to customize the available channels and the inclusion of advertisements tarnishes the experience, but those detractors don't outweigh the benefits offered by the app. The YouTube Kids app is available for free from the US iOS App Store. It is compatible with the iPhone and iPad.